Daily Illuminator: Get Ready For The End Times With GURPS! March 2, 2016: Get Ready For The End Times With GURPS! From the ashes of the old, forge a daring new world! GURPS is great for post-apocalyptic gaming, and Pyramid #3/88: The End is Nigh -- the most recent issue of Pyramid -- amps up your wasteland warriors with more options, opportunities, and opposition. It features a fascinating yet frightening gang from Jason "PK" Levine that would be a powerful ally or enemy, with GURPS stats for typical members, maps of their lair and the surrounding area, a player handout, and more. This issue also showcases David L. Pulver's look at using GURPS Mass Combat after the end times, including two sample armies that can challenge or aid hardscrabble heroes; S.A. Fisher's and Hans-Christian Vortisch's look at how to make and maintain firearms once civilization has fallen; Peter V. Dell'Orto's expanded examination of improvised weapons in GURPS; a guide to what happens to nuclear weapons and power plants once the world ends; and still other awesomeness. For those searching amid the ashes for signs and portents, this issue also provides clues about the forthcoming GURPS After the End series. 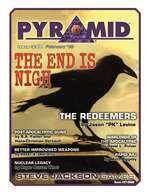 With Pyramid #3/88: The End Is Nigh, it's never been a better time to begin thinking about the end times! Pick it up individually, or subscribe to Pyramid today and keep your fallout shelter stocked with gaming goodness for months to come!